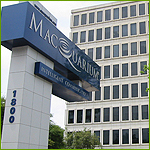 Centrally located between Midtown and Buckhead, the Macquarium Building is the perfect option for leasing office space. Purchased in 1997 by Adler Investments, LP, this eight-story building has been continuously updated, constantly adding features to make it a premier office facility. For more information on the Macquarium Building, contact Steve Beverly at 404.352.0402 or at stevebeverly@sebeverlyrealestate.com.